There’s a rugged and wild place, cradled in a mighty left hand of craggy stone, surrounded by mixed stands of cedars, spruce and pines, where the spindly fingers of white birches are splayed out and waving with the winds, betraying the location to the skies above. Here, the forest queen — wedded to eternity — disappeared around a sharp corner in the lichen-covered rocks. Trailing behind her like the wings of a moth, she pulled a luxurious and lengthy, sequined bridal veil. In 1910, a special street car service ran between the city and the waterfall here, accommodating thousands of visitors. “The falls was at its best yesterday,” the Calumet News reported that March. “The warm weather of the past few days provided a torrent of water, which gave the waterfall a very pretty appearance. In all its beauty, this also is a place of great danger and fatal fortunes, drawing scores of the curious entranced by the sights and sounds of the tumbling waters. One sorrowful and terrifying example is the case of 15-year-old Eugene Sullivan, which occurred during early April in 1912. In a springtime of unusually high water, the boy dared step close to look down into the black cetacean eye of the caldron blinking between the rocks. He slipped and fell 170 feet to the whirling plunge pool below. Many of the hundreds who had come to these woods, not far outside the mining towns, had witnessed the horror of the youth’s demise. Like the great Sherlock Holmes, who went over the brink at the Grand Reichenbach Falls battling Professor Moriarty, Sullivan died, but unlike Holmes, without the opportunity to return for a series of new adventures. Four days after Sullivan perished, a jury empaneled to determine the circumstances of his death, emerged from its deliberation at the Laurium Town Hall. The six jurors of the coroner’s inquest found the boy died of accidental drowning at the Houghton-Douglass Falls, situated in the Copper Country, about halfway between Calumet and Lake Linden. The jury recommended safeguards be installed to try to prevent future loss of life. Sullivan had by no means been the first to die at the waterfall and he would not be the last. Despite the concern of the coroner’s jury, deaths from drownings, falls and jumps would continue over generations into modern times. 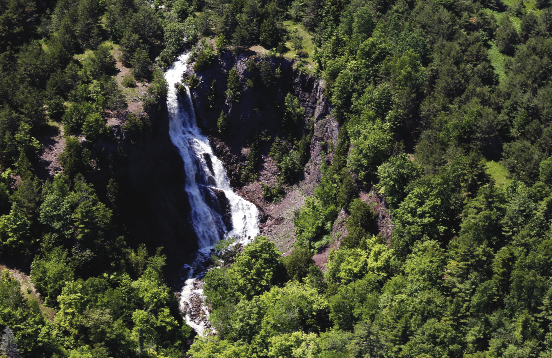 In recent years, property owner Jim Kuusisto had closed the falls to public entry, not only because of the inherent danger, but because he said the tremendous number of visitors were degrading the resource by creating erosion and other problems. “They were loving it to death,” Kuusisto said. In 1838, New York resident Columbus C. Douglass came to the Michigan territory at the age of 12. After Houghton was appointed Michigan’s first state geologist in 1839, Douglass was made his assistant. Houghton also had been born in Fredonia, New York, like his cousin, Columbus. Houghton came to the Michigan territory in 1830, at the request of the governor, to present a series of lectures in Detroit. Houghton and Douglass worked together in the Upper Peninsula on geologic copper and iron ore expeditions and surveys. Fifteen years after Houghton had arrived in Michigan, he was traveling to Eagle River from Eagle Harbor in a small boat with four other men. An October storm capsized the barge on Lake Superior. Houghton and two of the men drowned. Houghton’s remains were taken back to Detroit where he had been living. At the age of 36, he was buried at Elmwood Cemetery. After Houghton’s death, Douglass turned his pursuits to the practical exploitation of the mineral resources of the Lake Superior copper district, becoming one of the field’s earliest pioneers, according to Sawyer. “… It was largely due to his energy, sagacity and indomitable perseverance, that the great mineral resources of the Upper Peninsula of Michigan were developed,” Sawyer wrote. Douglass was headquartered in Houghton for 15 years after his cousin’s death. He had partnered with Ransom Shelden, who became Houghton’s first settler in 1852. Shelden had arrived in the area in 1845 from L’Anse. Douglass was Shelden’s brother-in-law. At one point, Douglass owned all the land where Houghton and Hancock were settled. He was the first individual landowner in Hancock, where he lived in a log house on the slope of the bluff for two years before he moved to Houghton in 1854. He served the people of the region in the Michigan Legislature. Douglass relocated to New York in 1863, maintaining his local business interests. He died in London in 1874. The great waterfall in the woods, arguably Michigan’s tallest, was named for cousins Douglass Houghton and Columbus Douglass. Though newspaper accounts differ in spelling, at least as far back as 1896 — in a report of another drowning — the waterfall was named the Houghton-Douglass Falls. Decades later, after a sign at the falls erected by a federal work crew was removed, the landmark began to be referred to most often as the Douglass Houghton Falls, in presumed honor solely of the former state geologist. This past week, a signing ceremony took place a short distance from the mighty cascades on Hammell Creek. Kuusisto is selling his 70 acres, including the falls, to the Michigan Department of Natural Resources. The site will be improved by the DNR, providing safeguards like those recommended by the Sullivan jury more than a century ago. The site will remain closed to the public until those improvements have been made. “It is hoped that time spent in this peaceful and tranquil setting can be a meaningful part of a full recovery,” Kuusisto said. On the darkest nights and the clearest of blue sky days, from behind the gray trunks of the cedar trees, with seductive eyes, the resplendent forest queen continues to watch back over her shoulder. She sees her long white veil of cold white cascading water, fanned out across the depths of the gorge. In the years to come, enchanted admirers are expected to continue to make their way to this place in pursuit of her charms — wild, rugged and enigmatically beautiful.